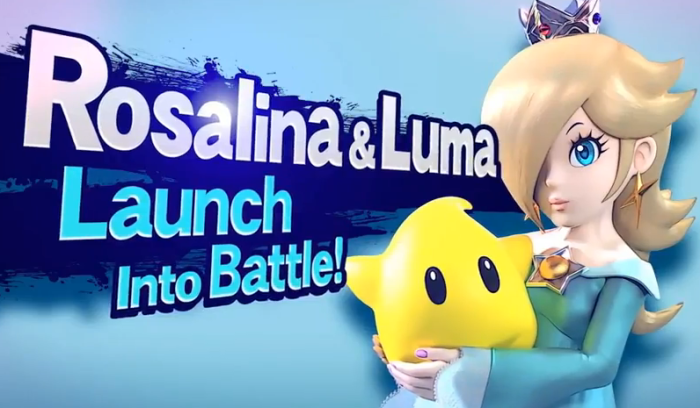 Super Smash Bros 4 announced a new character Princess Rosalina with Luma, today in their Nintendo Direct presentation. Nintendo President Satoru Iwata played a little trick with the trailer as it shows the racers of Mario Kart 8 which then turns into a SSB4 trailer. Kirby and the other racers stop dead in their tracks as Rosalina with her star side-kick Luma, appear in the middle of the track. Princess Rosalina is from Super Mario Galaxy for the Wii, and she will also be in Mario Kart 8 if this dual trailer is indeed a revealing. The last character revealed by Nintendo was Fire Emblem's Marth, back in early November. Marth made his first SSB first appearance in Melee for the Gamecube, and returned for Brawl on the Wii. He was the 18th confirmed character for the game. "Pic of the day. Marth joins the battle!! Once again, everyone will be overwhelmed by his magnificent sword skills!!" Sakurai said in his announcement in Nintendo's Miiverse. See the post and picture here. Unfortunately, Iwata did not disclose a release date for the upcoming game but it is still rumored to be sometime in April 2014. A German Nintendo executive hinted at the release date, but the main company quickly issued a statement that said, "We would like to clarify that the speculation about a Spring 2014 launch date for Super Smash Bros. on Wii U was the result of a misquotation in an interview." The characters confirmed for the game so far are: Mario, Luigi, Link, Samus, Kirby, Fox, Pikachu, Bowser, Donkey Kong, Pit, Olimar, Toon Link, Princess Peach, Sonic the Hedgehog, MegaMan, Wii Fit Trainer, and the Villager. Queen Rosalina becomes the 19th character.